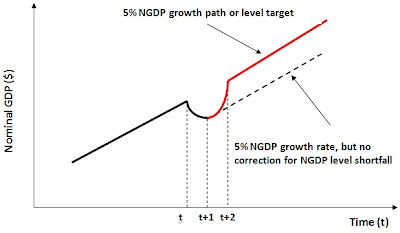 The black line has NGDP growing at a 5% annualized rate. Then, at time t a negative aggregate demand (AD) shock causes NGDP to contract through time t+1. There is now an a NGDP shortfall. To make up for it, the Fed must actually grow NGDP significantly faster than 5% to return aggregate nominal spending to its targeted level. For example, if NGDP fell 6% between t and t+1 it is now 11% under its trend. Next period the Fed must make up for the 11% shortfall plus the regular 5% growth for that period. In short, the Fed would need to grow NGDP about 16% between t+1 and t+2 to get back to trend. This temporary burst in NGDP would probably make the inflation critics nervous, but they shouldn't be. 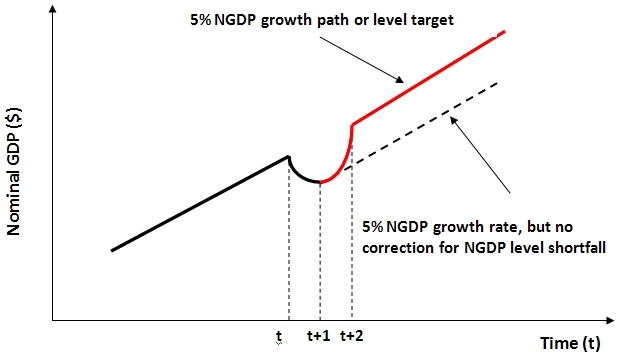 There might be temporarily higher inflation as part of the rapid NGDP growth, but over the long-run a NGDP level target would settle back at 5% growth. Nominal expectations would be firmly anchored. If level targeting were more widely understood I suspect there would be no Bernanke Conundrum. Update: The implication of the above discussion is that the Fed has allowed NGDP to fall to the dashed line as seen here. Also, Marcus Nunes discusses Paul Krugman's piece. Maybe Bernanke is reading alot of post-keynesian stuff nowadays? He seems to keep on waiting for the government to step on the gas so he can tap on the break. I do smile at people thinking that the Bernanke FED has worked massive "reckless" stimulus when that has hardly been the case. Even "QE 1 and 2" were just agency purchases. What would happen if Bernanke enacted a target by buying up all the non-agency RMBS he could find? Me thinks it would retire a good deal of debt and get money flowing through the markets again at a normal trajectory, boosting the economy and leaving the Jap/Zirp conditions behind. The governments not coming to the rescue with a multi-trillion dollar infrastructural program and manned space trips to the moon or mars(though I can't argue against the idea though). Yes. On reading Paul Krugman's otherwise very good article, I felt the one big thing missing was some discussion of level-targeting (either P or NGDP). BTW, are Krugman and John Taylor going to get married at the altar of Market Monetarism? They are both migrating in the right direction. you know that awkward conversation you have to have with your partner when you've spent too much money on something they didn't know about, or didn't fully understand, and then it doesn't turn out to be the amazingly great thing you thought it would be? and you, well, have to come clean about it. that's what has to happen in all the western countries. somebody has to get on that TV and say, um, well, see, we don't actually have the money we promised you. it isn't going to work out, and we're really, really sorry. let's talk about how not to let this happen again. but instead of that they're trying to promise they - the ones who completely messed the entire situation up to begin with - will fix it all if you just back them up this one more time with their "austerity" plan. instead, they should beg forgiveness and ask the general population for advice. form citizen advice committees. *something* to open it up, and acknowledge they are in no position to be blathering on about solutions.